I'm still trying to decide what I love most about this room. The centered tub? The perfectly matching towels? The shower head? The white nesting tables? The perfectly displayed bath products? 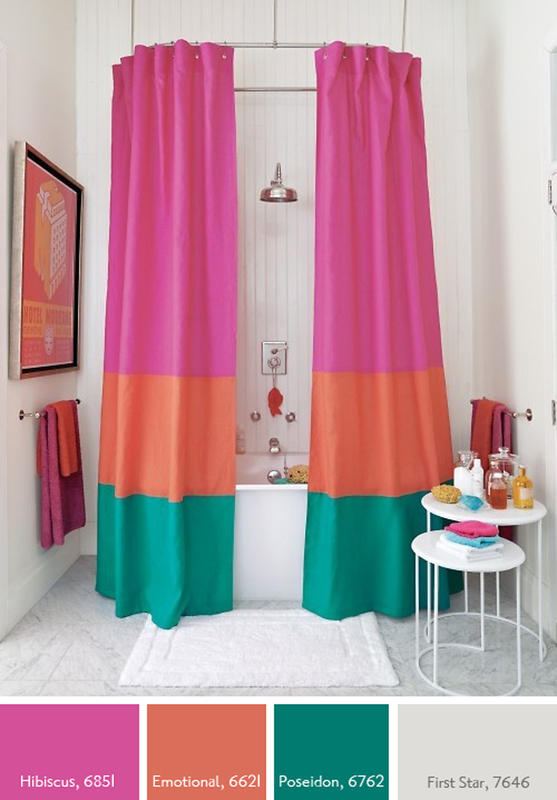 Or maybe it's this beyorgeous (that is beyond + gorgeous) shower curtain. I think that is it :) MS has a tutorial here on how to make your own by sewing different fabrics together but I was thinking that some painters tape and paint could do the trick too! Just jot down the colors I have listed below and talk to your local rep about what type of paint to use. wow! and love the idea to try this on a plain curtain with paint!